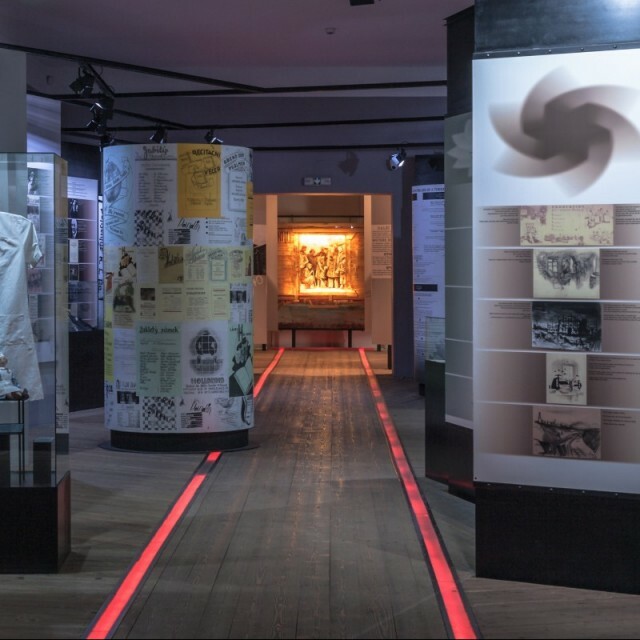 To mark the 50th anniversary of the start of deportations of Jews from the Protectorate of Bohemia and Moravia, the first permanent exhibition on the history of the Terezín Ghetto was opened in the former municipal school in Terezín in the fall of 1991. In this way, efforts for a dignified commemoration of the Ghetto victims and correct explanation of its history, tasks facing not only the employees of the Terezín Memorial together with the former inmates but also other representatives of the country’s public life, finally come to fruition after more than forty years. The Museum’s newly conceived permanent exhibition entitled ”Terezín in the 'Final Solution of the Jewish Question '1941 – 1945“ was inaugurated in 2001. In addition to this documentary exhibition, which forms the backbone of the Museum, we can also find here a Memorial Hall of the Terezín Ghetto’s Children, devoted to its youngest victims, plus a selection from the world-famous drawings made by children from the Ghetto, a scale model of the Ghetto with an electronic orientation system showing its individual thematic units and with relevant information for visitors, for the local reading room and the cinema where documentary films are screened. The Ghetto Museum also presents short-term exhibitions, documentary films are shown in the cinema, and a variety of brochures, books, videocassettes and souvenirs are on sale.